Emergency dentists are always open, ready for service at a short notice. If you are suddenly attacked by a horrific toothache and are seeing stars in your eyes, then emergency dentists are your best friends. They have all the resources and skills at their disposal, with which they can treat almost any kind of dental problem immediately. Whether you have a severe toothache that will not go away, have accidentally chipped your tooth, or have loosened your fillings while eating, these emergency dental clinics will always be able to help you. You will always find one near you, and we assure you that you can trust these with your dental problems. They offer all sorts of services, for example, cosmetic dentistry, invisalign, periodontal gum disease, preventive dentistry, restorative and general dentistry, etc. If you come down with a sudden case of a bad dental day, then do not hesitate, just contact one of these dental clinics, and let them handle your problems. Vallejo is the largest city in the Solano County of California, United States. It has a huge population of 115, 942 as recorded in the 2010 population census. In this large city, are many dental clinics and dentistry that are there to provide constant help to its people no matter the time. The services they provide cover all day-to-day dental problems, and even those that are more complicated. Dental emergencies may be rare, but theyare the worst when they do occur. 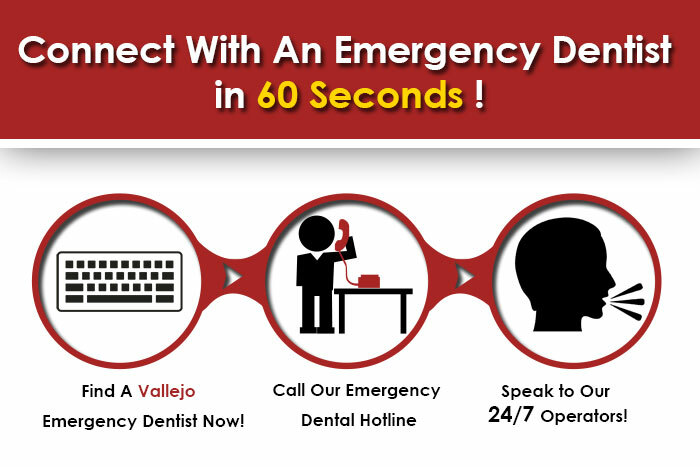 Emergency dentists are not a rare thing in Vallejo, and you can find one in every other street. These dental clinics have highly professional doctors and a certified team that knows exactly how to deal with individual situations. The services are carried out by a talented group of dentists and their hardworking team of trained assistants, who take the utmost care of their patients and guide them carefully throughout their examination and treatments. This clinic provides preventive, cosmetic, regular, restorative, and even orthodontic services to its patients. They do everything from whitening, wisdom teeth extractions, to dentoalveolar surgeries, apexogenesis, etc. Give them a call if you need them at 1-800-32-SMILE and press 1 to make an appointment. Marina Vista Dental is known as a cosmetic and family dentistry, which can solve all kinds of problems that you may be facing with your teeth and gums. They conduct cures for common problems, gum disease, etc. To get in touch with them, call at (707)552-2228 or visit them at 285 Mare Island Way, Vallejo, CA 94590. Dr. Prigmore and his team offer personalized treatment and sedation dentistry services in a way that is always relaxing and satisfying for the customers. They are always open and you can call them at anytime for help at the number 707-552-7744. You can also go directly to the clinic and be engaged in their wonderful service at the address- 1620 Valle Vista Avenue, Suite 100, Vallejo, CA 94589.